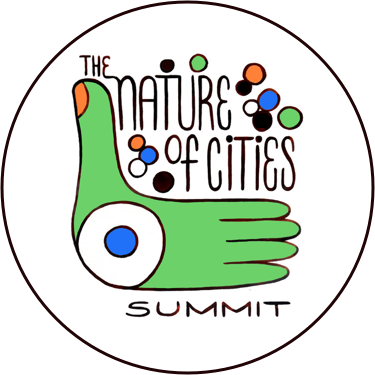 Much of the fabulous writing on The Nature of Cities blog site to date has focused on integrating the built and natural environment, erasing, or at least softening the lines that separate the natural and the manmade. I would like to shift focus a bit and explore the intersection between people and wildlife and suggest that we would also be wise to consider how we integrate animals into our urban stories, poems, art, culture and collective narrative. We need to bring the same level of creativity and imagination that we are currently investing in transforming our physical landscape into repopulating our mental landscape with the diversity of life that surrounds us. In short, we need to do a better job telling animal stories — urban animal stories. I am not talking here necessarily of ecology, biology and natural history, although ecological literacy is of critical importance. I am taking at least one step further back into the realm of mythology, legend and folklore, about how we tell and retell our own story in a way that truly recognizes wild beings as fellow travelers on our urban landscapes. 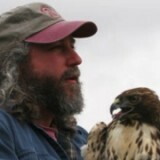 For many years I ran Portland Audubon Society’s wildlife hospital. There we treated upwards of 3,000 injured wild animals and responded to more than 15,000 wildlife related phone calls each year. The vast majority of both calls and animals emanated from the urban and suburban landscape. One of the indelible impressions from those years was how often somebody would walk into our center having taken significant time out of their busy day to deliver an injured animal, and ask us some variation on “what is it and why is it here?” They would insist that until that very morning, when the animal was dragged in by the cat or slammed into their kitchen window or collided with their car, they had never seen this creature in their neighborhood before. We would slowly open the box only to find ourselves eye to eye with…a crow…or a robin…or a scrub jay…or a fox squirrel. Often however, when the same people returned a few weeks later to pick-up the repaired animals for release, they would tell us that their neighborhood was suddenly teaming with never before seen wildlife. A connection was made…eyes were opened. 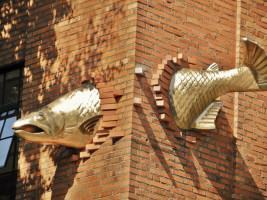 Fish art on downtown Portland, Oregon (USA) building, Photo by Bob Sallinger. The human mind is good at filtering information and more than 35,000 years after humans first painted wild animals on cave walls, we have done a remarkable job of exorcizing wildlife from our consciousness. We don’t expect to see wildlife in our cities and therefore we don’t…until something or someone alters our expectations. Those animals we treated at our hospital were sad and broken, but at the same time they also painted a rich tapestry of stories about how wild animals live and die in our urban landscape and how they interact with one another and with us. These stories are not the stuff of field guides, PhDs or wildlife management plans. They are funny and sad and weird and mysterious…sometimes they are mystical. 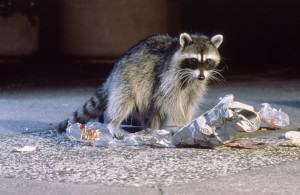 Raccoon as urban trickster. Photo by Michael Durham. If we restore it, critters will come, but we are not always sure what to do with them when they get here. Coyotes run off with cats, raccoons roll garbage cans, birds slam into windows, deer browse grandma’s flower beds, otters crack shellfish on the decks of high priced yachts…they are our own modern day tricksters. Throw a high concentration of humans into the mix and the opportunities for mayhem increase exponentially. Among my favorite vignettes: the woman who wanted me to suggest a natural area to release her pet alligator. It was cute, apparently, when she bought it, but now it is three feet long, won’t stay in the bathtub and seems inclined to eat the kids and Chihuahua. Apparently they don’t read the signs. Photo by Bob Sallinger. The gentleman who graciously shared his hot tub with the neighborhood raccoons because “all the wetlands have been filled” and could not understand why the ungrateful little beasties decided to dismantle it one day while he was at work. The lady from the Greek restaurant who delivered leftover souvlaki to a street corner in an upscale Portland neighborhood each morning to feed the local coyotes who promptly began associating all people with restaurant handouts. Nursing moms who suckle orphaned raccoons (yes, really… and it happens more often than you might think!). Working on urban wildlife management issues is sometimes a bit like living inside of an extended “Far Side” cartoon. A friend who works as an urban natural resource planner once told me that 90% of her job was trying to get people comfortable with “messiness.” She is right. A big part of the challenge before us is integrating messiness into a culture that increasingly prioritizes higher and higher levels of organization. Souvlaki Coyote on the prowl in downtown Portland, Oregon (USA). Photo by Bob Sallinger. Over time I came to realize that wildlife rehabilitation was about fixing broken animals, but it also was just as much about being a chronicler of the animals in our midst. I slowly realized that the succession of stories that I heard day in and day out were indelibly transforming my own mental map of the city. As I move about Portland now I can’t help but transpose those stories onto the landscape. That corner is where coyote loped across the highway and disappeared behind a bar….this fire escape is home to a pair of red-tails that sometimes bop high-rise construction workers that intrude upon their airspace…that bridge is where a pair of Peregrines have nested since 1994 and fledged 58 young…and so on. 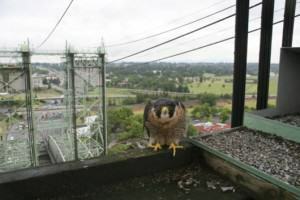 Peregrine nesting on Portland Bridge. Photo by Bob Sallinger. I am after something different here. How do we create stories that fundamentally reconnect our communities with the life forms that surround us? The types of stories that imbue our urban landscape with the magic, mystery, ambiguity, messiness…inspiration that comes with a recognition that we are not alone…we weren’t even here first. 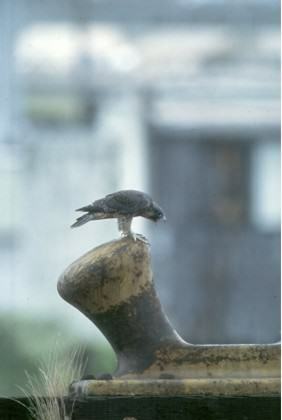 Fledgling Peregrine exploring Portland’s industrial landscape on foot. Photo by William Hall. Our lack of awareness plays out subtly as we consider policies to re-green our landscape. Too often our decision-makers and the community at large view wildlife as something we should consider adding as opposed to recognizing wild animals as something that has always been and will always be part of our urban landscape. 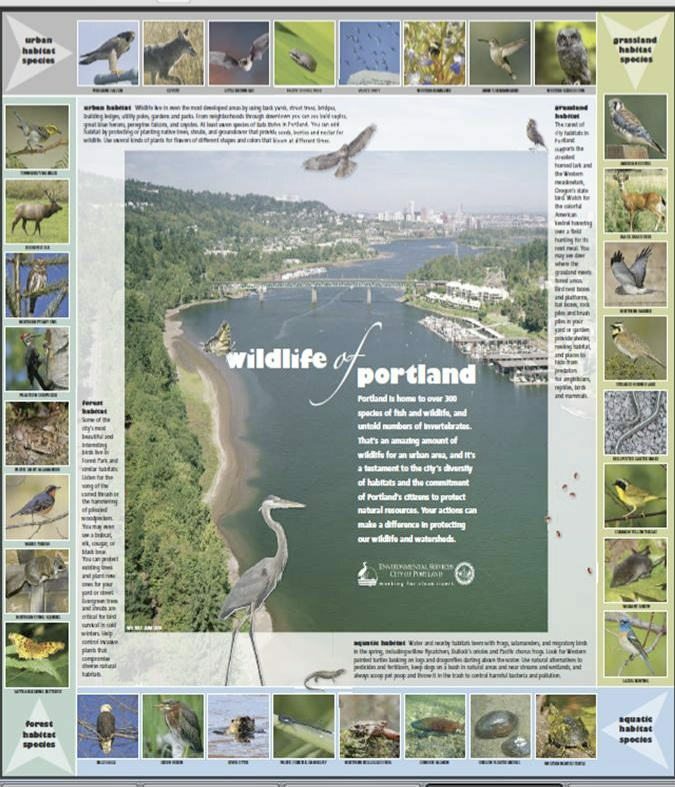 In a city like Portland, which sits at the confluence of two great rivers, wild animals will continue to live upon and migrate through our landscape. The only question is whether we will provide for their needs when they are here. There are signs of progress. I am intrigued by the proliferation of urban wildlife webcams. 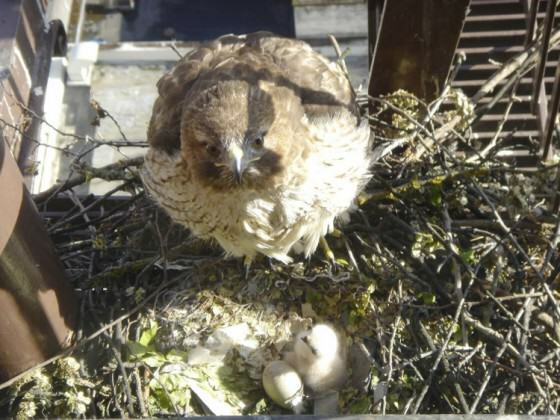 Several years back, Portland Audubon collaborated with a local television station and placed one above a pair or Red-tails that nest on a downtown fire escape and “Raptor Cam” was born. As something of a Luddite, I was initially skeptical and frankly appalled by the substitution of digital experience for direct experience. Raptor Cam Red-tail on nest. Photo by Dieter Waiblinger. Half a decade later, I see it differently. Each year the site gets nearly a million hits as people track these birds like a soap opera. They anticipate and celebrate and grieve and discuss and opine on line with one another. I hope and wonder if perhaps it causes them to look skyward more often when they actually are outdoors. My friend Mike Houck of the Urban Greenspaces Institute (and who also writes on this blog) was after the same type of awareness when he commissioned a giant mural of our urban birds on an bare mausoleum wall overlooking Portland’s first natural area at Oaks Bottom and when he convinced a local brewery to name a microbrew after Portland’s official city bird, the Great Blue Heron. Oaks Bottom Mural, Portland, Oregon, commissioned by Mike Houck. Photo by Nelson Photography. I see it as well in books like Wildwood by Colin Meloy and Carson Ellis which transforms Portland’s Forest Park into an impassible wilderness occupied by baby snatching crows and scheming coyotes. Even the television show Portlandia, with its ubiquitously referenced (at least in Portland) “Put a bird on it” sketch edges towards what I am after. 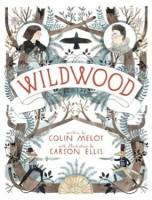 Wildwood by Colin Meloy and Carson Ellis. 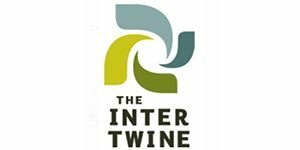 This site has attracted an amazing array of experts already but I hope as it continues to expand it can perhaps pull in some poets and storytellers. To that end I will leave those who have read this far with one of may favorite urban wildlife stories. It involves a crow named “Havoc” that I came to know several years ago. It has been more than a decade since I last saw him, but he has forever altered the way I look at crows. One of Portland’s more unique residents was a crow appropriately dubbed “Havoc.” Havoc was discovered in downtown Portland where he spent his days drinking out of the Benson bubblers, dodging traffic and barking at blond women. Our best guess is that he had been illegally raised as a pet and then set free. 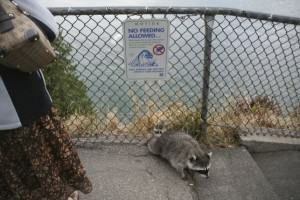 Eventually his antics resulted in his capture and delivery to Audubon’s Wildlife Care Center. Upon arrival, he immediately released himself from the confines of the pet carrier in which he found himself imprisoned, flew to nearest sink, turned on the faucet and had himself a nice, long, cool drink. Once satiated, he turned to the assembled staff and volunteers, gave three high pitched barks, “whoop, whoop, whoop,” and bowed. Havoc lived at Audubon’s Care Center for a year during which he served as an education bird teaching kids about the importance of keeping wild animals wild. With a penchant for blondes, bathes, mice and mealworms, he quickly became a favorite of the general public. Generally he had the run of the place during the day but was caged at night—something he openly and vocally despised. He would greet us each morning by springing up and down in his cage like some manic, feathered pogo stick. Failure to satiate his ever-changing desires quickly resulted in what only can be described as a vindictive temper-tantrum, a full-fledged squawking, shrieking, food flying, ankle pecking, crow freak-out. His tastes were expensive too—one day I turned to find him removing the prism from a five hundred dollar ophthalmoscope. Several months after arriving Havoc decided to test out what it was like to be free again—my suspicion is that he was thinking about it for quite some time because he waited until several doors were simultaneously open and then launched himself through a succession doorways and out into our sanctuary. A short while later we began receiving reports of an oddly vocal crow down by the creek that runs through our property. The creek was running high and muddy from winter rains and perched in the middle on a barely exposed rock was Havoc. Upon seeing us, he immediately leapt off the rock and made like some sort of mutant dipper, dunking himself completely below the surface and then reappearing to preen and make sure that we were still there watching. Each time we moved toward him, he inched away. It was about the time that we were about to leave him to his freedom that a particularly large swell in the creek caught him off-guard. The sight of the distraught crow tumbling beak over claw down the creek surfacing occasionally to gurgle out a forlorn shriek was matched in absurdity only by the foolish human who dove in after him and emerged on the opposite bank muddy, drenched, ungrateful biting crow firmly in hand. He was sent for a short time to live at Oregon State University where he participated in a study of captive crows. The professor in charge arranged for a cohort of blond coeds to visit Havoc on a daily basis to keep him reasonably entertained. I have always wondered about how many times the professor in charge got turned down before he found students willing to participate. “So, I have this crow that likes blonds and I was hoping you might be able to swing by my lab about 3 pm…” Havoc eventually returned to Audubon, irascible as ever. Eventually Havoc was set free on a property at the edge of the urban growth boundary where the neighbors were apprised and accepting of a somewhat odd bird. He spent many months in the vicinity perfecting the art of pushing azalea pots off porches and showing up uninvited at local barbecues. One day Havoc was sighted keeping company with other crows. However, when the flock left to roost Havoc was left behind, apparently absorbed in watching a man fly his model airplane in the field below. As time wore on his interactions with the flock increased. The last known Havoc sighting was at a local school. A man working in the school basement turned to find Havoc barking at him from the window well. That was just around sunset. The next morning the flock had moved on and Havoc was nowhere to be found. This was a rich, wonderful read. Thank you for highlighting some of the ways animals factor in to our stories, and for sharing the story of Havoc at the end. I would love the chance to share your perspective with readers of our blog, Green Infrastructure for Your Community. Would you be willing to let us reprint it? Of course we would credit you and link back to the original Nature of Cities posting. Great posting! I am very fascinate about the wildlife and love to know about it, thanks for sharing about it. feet that go down in the mud where the truth is. This is a very interesting article. Story telling on urban wildlife is a unique way of educating the people about their local wildlife. And these stories are not found in journals but in the memories of the people. I was raised in the city , in a dense urban environment where even an encounter with a local animal life is a pleasant change in a busy urban lifestyle. I remember this particular incident that took place in our architecture studio. The studio had high windows for cross-ventilation, occasionally pigeons would fly over and pass through the structure. It was a delight during some drab lectures. But one summer afternoon I witnessed a deadly accident with the bird colliding with a running ceiling fan. I guess this is how urban life lives and dies leaving behind stories of their interaction with urban landscape. This shows our design of urban structures and landscape lacks in incorporating the different biodiversity that live there. This would be a good example of how we should be providing for their needs when they were the first ones here. Repairing the ecology and instigating people to learn about the biodiversity will need initiatives from the city and the willingness to connect with nature. I like the idea of ‘giant mural of a local bird’- to spread awareness. Maybe awareness programs can be run on regional/local level. For example, having a “Great-Blue Heron week”, where information fliers and an interesting live feed of the birds are shown for a week. I agree that live webcam feeds lack the natural experience but it does spread awareness much faster in this digital era. Cool cool. I remember reading about the story of Prometheus and then Raven (the trickster) in a high school comparative literature class. It really made me look at Crows and Ravens a lot differently. Amazing power in animal stories. Oh, and here’s a set of lovely images from another urban wildlife tale: the endangered San Joaquin Kit Fox that apparently prefers to hang out in the suburbs of Bakersfield (yes, that oil-and-ag town in the southern Central Valley of California) rather than its “natural” habitats which conservationists are desperately trying to protect from agricultural expansion and fragmentation. So how can conservationists deal with suburbia-loving endangered species without expanding their narratives about what is and isn’t suitable habitat for different species? Lovely stories, and beautifully told in this post too! I completely agree with you that we need to integrate urban wildlife into our cultural narratives – but not just in popular culture. As an urban ecologist who has spent most of the past decade in this Far Side cartoon world (after spending my first decade as a professional ecologist running away from cities looking for “wilderness”), I must add that many ecologists and environmentalists too are unaware of the wildlife that may be living all around them because they are too focused on protected areas and “pristine” ecosystems. The scientific narratives in ecology too, therefore, need to incorporate these urban stories, and some of us are trying to do so, despite skepticism from many who continue to view cities as merely “disturbances” at landscape scales that represent “sink” habitats or ecological traps at best. I like your philosophy Bob – and the stories! There are so many positive anecdotes and stories that bring urban wildlife to public attention. Its a rich vein to mine, and much more accessible to people than traditional natural history. Great posting, Bob. Being a storyteller (in the form of a nature writer/essayist), I absolutely agree about the need for more stories that connect us to our wild neighbors and the landscape we inhabit. I too have had the experience, in my middle age, of “discovering” the abundant presence of birds that live in and around Anchorage, AK (where did they all suddenly come from?) as well as the wonderfully curious presence of wood frogs, which survive northern winters by freezing solid. We are surrounded by amazing stories — and wild beings — if and when we finally pay attention. Thanks for this beautiful piece. I’m a scientist, but comfortable with the cultural value of (at least some) anthropomorphism. Our stories and shared experiences are a critical facet of our relationship to urban nature. That’s such a beautiful story (about Havoc the crow). Here in Bangalore (and across most Indian cities too) there are traditional practices to provide food to support urban wildlife – rice for the crows, sugar for ants, chapatis for squirrels and birds, milk for snakes – but sadly, these traditional practices are disappearing fast as more people move from homes with gardens into apartments, and as their lives get busier. The idea of developing an urban storytelling culture around wildlife is a great one.